Nebraska signed just one player Wednesday on National Signing Day – wide receiver Demariyon Houston from Millwood High in Oklahoma City. Addressing the media from Memorial Stadium, Husker Head Coach Scott Frost said that during this signing period, it was slim pickings. Houston, who was also a cornerback and punt returner for his high school team, will provide much needed depth to a wide receiver corps that desperately needs it. Houston is one of three receivers in the 2019 class, along with Jamie Nance and Darien Chase. They’ll have big shoes to fill, considering Stanley Morgan, Nebraska’s all time career leader in receptions and receiving yards, played his final game in a Husker uniform in the Fall. 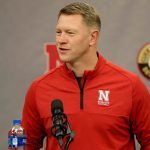 After a disappointing 2018 campaign that ended without a bowl trip, Frost is itching to get his team back out onto the field. With the first spring practice slated for March 4th, it’ll be time soon enough. The players are ready too. Frost said that from his office view located just above the weight room, he’s liked what he’s seen so far. He noted that players were putting in effort, which wasn’t necessarily the case last season.